What's on your Apple Watch home screen? I don't use my Apple Watch the way I use my iPhone, but I do like that it has a home screen where I can get an overview of all my apps. I haven't done anything too fancy with it yet, like make patterns or streamlined shapes, but I'm going to give that a try this weekend. You can set up your Apple Watch home page pretty much any way you want either by dragging a few apps around on the watch itself or by doing major rearrangement using the Apple Watch for iPhone app. So here's mine, now show me yours! Messed around with mine last night, need to download more apps before i can make the outline of anything meaningful, lol. I am kinda enjoying the watch "stock" for the moment. Still working on shape. May also have to pare down my apps -- especially as apps I like more add a Watch extension! I'm letting form follow function. Using the clock as the centerpiece I've got workout/hydration, moving up, the workout migrates to weather. Below the clock, music, then productivity. (still working on the productivity arrangement). Pinwheel type. With each spoke a different category. tonztime, Bigeric23 and dianahk like this. If you don't mind me asking, how are you liking Flipboard on the watch? I like it! It lets you read about half an article. It does take quite awhile to load, but that's the case with any Apple Watch Apps at the moment. How did you manage this? I'm trying to get a similar setup but it wont work for me. Don't know how you guys have so many apps sheesh! LOL. 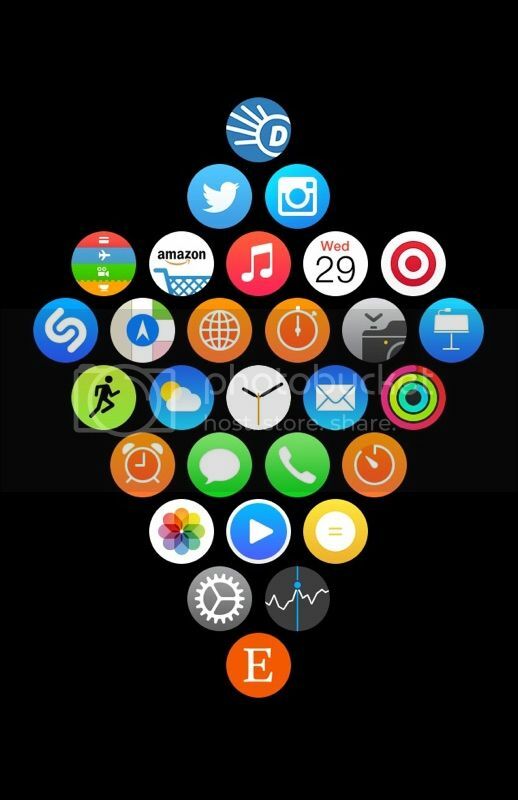 My Apple Watch layout is the closest thing to an iPhone layout that I could manage. Apps are organized into cluster types: Social, Financial, Health, Entertainment... Each cluster consists of 7 apps. In the center cluster around the clock are the most frequently used apps. From there I'm no more than 2 swipes away from the 8 surrounding clusters and I know exactly where each cluster is. Microcosmos, Leandro, Tartarus and 8 others like this. How did you keep them from Falling like Marbles? You have to build out in wide rows and columns and then move apps to a cluster, leaving a single app as a connector between clusters. You can't build the clusters without first having a wider band of apps (in this case 3-apps wide). Bigeric23 and lavonda like this. Can I see the heart rate in the health app on the iphone ?